Ryukyu Shimpo – Okinawa, Japanese newspaper, local news » Enagic USA donates 120000 500 ml bottles of water to victims of the Japan Earthquake. 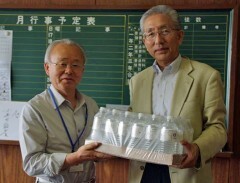 Katsutaka Idokawa (left), mayor of Futaba Cho, Fukushima Prefecture, receives bottled water provided by Shozo Yamaguchi, executive officer of Enagic Japan. Enagic USA, Inc. (President & CEO Hironari Oshiro with its U.S. headquarters in Los Angeles) recently sent bottled water to the areas hit by the Great East Japan Earthquake. Since the earthquake and tsunami, the company has collected donations for earthquake relief from its employees and its distribution outlets across United States. The headquarters heard from its local delivery agent in Tohoku that drinking water is in short supply in the stricken areas. A bottled mineral water company in California responded to the order by Enagic USA by increasing production to fill a large number of bottles for the emergency relief aid. Enagic USA shipped 120000 500ml bottles of water (four 40-Foot-Containers) as the first relief aid direct to total six evacuation facilities in the affected areas, including two at Futaba Cho, Iwaki City, Soma City in Fukushima Prefecture, Kesennuma City in Miyagi Prefecture and Otsuchi Cho in Iwate Prefecture. “We hope that people in the affected areas are able to return to their normal lives as soon as possible,” said a spokesperson for the company. According to the company, USA Sagawa, Sagawa Global Logistics, the Tokyo Customs Office, the respective prefectural governments and other local organizations cooperated and worked well together, including giving approval as special import as relief aid, so as to facilitate a quick delivery from the United States of a large quantity of bottled water to victims.